The Jackets had a tough road trip game against the Pittsburgh Panthers this past weekend. The Jackets who were 15-12 before the game found themselves getting swept by the Panthers who had an overall record of 14-11 be. Game one was a 13 inning nail biter, but the Jackets came up just short, falling 4-3. Junior Josh Heddinger took the mound for game one, going 5.2 innings giving up only five hits, three earned runs and striking out six. Senior second baseman Mott Hyde got the Jackets on the board in the third inning with a two-out single that brought freshman third baseman Elliott Barzilli home. A single from Junior first baseman Thomas Smith in the same inning brought Hyde home, giving Tech a 2-1 lead. Pitt’s left fielder Boo Vazquez put the Panthers back on top in the bottom of the inning with a two-run shot. Junior center fielder Daniel Spingola knotted things up in the fourth inning with a RBI double that brought Barzilli home. Spingola’s double extended the junior’s hitting streak to 11 straight games. The teams remained scoreless for the next eight innings until Pitt’s Steven Shellinsky hit a walk-off double that ended the game by a score of 4-3. Reliever Jon Danielczyk came out for Pitt in the fourteenth inning to get the win. Junior pitcher Devin Stanton took the mound for the Jackets in game two of the three game set. Stanton went 4.1 innings giving up five hits, two earned runs and striking out four. Hyde had a big game for the Jackets with three hits at the plate. Tech sophomore left fielder Matt Gonzalez provided a web gem for the Jackets in the eighth inning when he gunned out a runner at home all the way from left field. Besides the work from Hyde, the Jackets would struggle at the plate, recording only four hits in the game. The game was scoreless until the Panthers broke it open in the bottom of the fourth inning, scoring a couple of runs. They added on to the lead with a run in the sixth and two more in the eighth. Joseph Harvey was a big part of Pitt’s win. Harvey went for eight innings, striking out three, walking two and only giving up three hits, improving his overall record to 2-1. The Jackets looked to turn around their misfortune in the final game of the series. Junior pitcher Matthew Grimes started the game for the Jackets, going five innings, giving up five hits, three earned runs and recording three strikeouts. Hyde continued his good work at the plate with two more hits and extended his hitting streak to six games. Pitt’s shortstop Dylan Wolsonovich got the Panthers on the board early with a two-run single. Spingola cut the lead in half with an RBI single in the fifth. The Panthers responded by adding runs in the bottom of the fifth and sixth innings. The Jackets freshman shortstop Connor Justus, looking to get the rally, started the top half of the seventh with a triple to left field. Justus eventually scored in the inning on a passed ball by Panthers pitcher Matt Wortherspoon. Tech come up just short in the third game, loosing by a score of 4-2. Grimes suffered his first loss of the season, falling to 3-1. 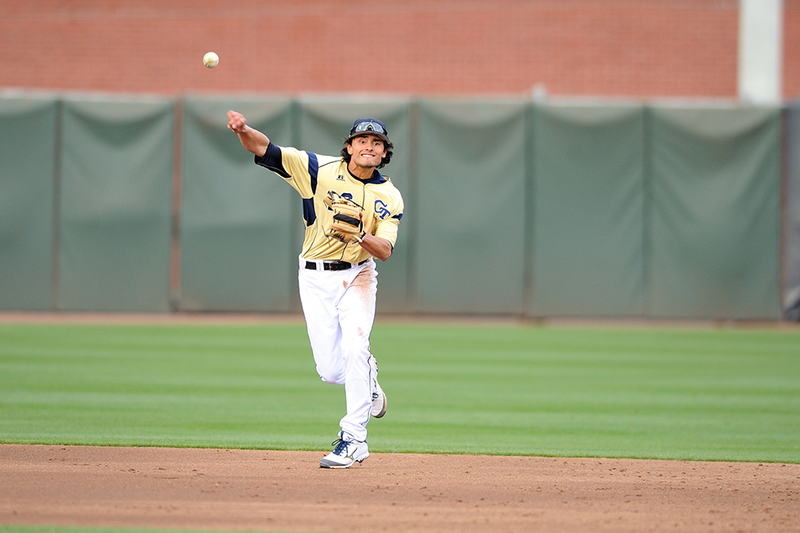 The Jackets host the Duke Blue Devils in a three game series starting tonight at Russ Chandler Stadium.